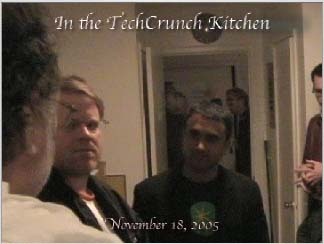 Here's some spoon fulls of what was cooking in the TechCrunch Kitchen on November 18, 2005. The audio wasn't optimal since it's a small, somewhat enclosed space with other people's voices bouncing and creating interfering. So I subtitled (abbreviating some of the sentences) in parts. 0:04: Robert Scoble on a blogging web service that automaticaly highlights, searchs and find tags in other services related to the text as it's typed in. 1:35: Munjal Shah, CEO & Co-Founder of Riya, on the value of blogs to company PR. 2:15: Munjal on the release of Riya alpha 2. 2:38: Munjal on the next step in Riya, the discovery search. Everybody's photo metadata is searchable, but access to private photos is through a negotiated access control. 3:20: Steve Gilmor asks Munjal whether if it will be institutionalized that the metadata is open.